This document is a proposed submission to the W3C Social working group. This document was published by the Social Web Working Group as a Candidate Recommendation. This document is intended to become a W3C Recommendation. Comments regarding this document are welcome. Please send them to public-socialweb@w3.org (subscribe, archives). W3C publishes a Candidate Recommendation to indicate that the document is believed to be stable and to encourage implementation by the developer community. This Candidate Recommendation is expected to advance to Proposed Recommendation no earlier than 06 June 2017. Alyssa's server looks up Ben's ActivityStreams actor object, finds his inbox endpoint, and POST's her object to his inbox. This protocol permits a client to act on behalf of a user. For example, this protocol is used by a mobile phone application to interact with the user's social stream. This protocol is used to distribute activities between users on different servers, tying them into the same social graph. For this specification to advance to Proposed Recommendation, there must be at least two independent, interoperable implementations of each feature. Each feature may be implemented by a different set of products. There is no requirement that all features be implemented by a single product. Independent implementations are developed by different parties and cannot share, reuse or derive from another qualifying implementation code which is directly pertinent to the implementation of this specification. Interoperability occurs between clients and servers, or between servers and other servers, when the client/server makes a request to the targeted server, and the targeted server sends the expected response, as defined by this specification. An implementation is an ActivityPub client, server or federated server which implements the corresponding conformance class of the specification. Discovering an actor's profile based on their URI (either the representation of the actor itself, which is probably an Actor Type, or a Profile object describing the actor). See the Actors section of this document for more information on what information is expected. A client receiving authorization and subsequently submitting an activity to the authenticated actor's outbox. A server handling an activity submitted by an authenticated actor to their outbox and handling client to server interaction side effects appropriately. A federated server delivering an activity posted by a local actor to the inbox endpoints of all recipients specified in the activity, including those on other remote federated servers. A federated server receiving an activity to its actor's inbox, validating that the activity and any nested objects were created by their respective actors, and handling server to server side effects appropriately. The Working Group has marked the following features as At Risk and may seek to advance the specification with the removal of these features if insufficient implementation experience can be gathered. 6.11 Uploading Media and its associated endpoint. 7.1.3 Public Inbox Delivery section and its associated publicInbox endpoint. 6.1.1 Object creation without a Create Activity. 6.2.1 Partial Updates. In absence of this section, updates for client to server result in an entire replacement of the object rather than modifying individual fields. Identifiers MUST be provided for activities posted in server to server communication, unless the activity is intentionally transient. However, for client to server communication, a server receiving an object posted to the outbox with no specified id SHOULD allocate an object ID in the user's namespace and attach it to the posted object. Servers MAY require authorization as specified in 8. Authentication and Authorization, and may additionally implement their own authorization rules. Servers SHOULD fail requests which do not pass their authorization checks with the appropriate HTTP error code, or the 403 Forbidden error code where the existence of the object is considered private. An origin server which does not wish to disclose the existence of a private target MAY instead respond with a status code of 404 Not Found. A json object which maps additional endpoints which may be useful either for this actor or someone referencing this actor. This mapping may be nested inside the actor document as the value or may be a link to a JSON-LD document with these properties. Upload endpoint URI for this user for binary data. An optional endpoint used for wide delivery of publicly addressed activities. publicInbox endpoints SHOULD also be publicly readable OrderedCollection objects. The outbox stream contains objects the user has published, subject to the ability of the requestor to retrieve the object (that is, the contents of the outbox are filtered by the permissions of the person reading it). If a user submits a request without Authorization the server should respond with all of the Public posts. This could potentially be all relevant objects published by the user, though the number of available items is left to the discretion of those implementing and deploying the server. 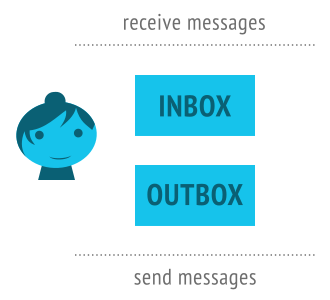 The inbox stream contains all objects received by the user. The server SHOULD filter content according to the requester's permission. In general, the owner of an inbox is likely to be able to access all of their inbox contents. Depending on access control, some other content may be public, whereas other content may require authentication for non-owner users, if they can access the inbox at all. The server MUST perform de-duplication of activities returned by the inbox. Duplication can occur if an activity is addressed both to a user's followers, and a specific user who also follows the recipient user, and the server has failed to de-duplicate the recipients list. Such deduplication MUST be performed by comparing the id of the activities and dropping any activities already seen. Every actor SHOULD have a followers collection. This is a list of everyone who has sent a Follow activity for the user, added as a side effect. This is where one would find a list of all the users that are following the actor. The followers collection MUST be either an OrderedCollection or a Collection and MAY be filtered on privileges of an authenticated user or as appropriate when no authentication is given. The follow activity generally is a request to see the objects a user creates. This makes the Followers collection an appropriate default target for delivery of notifications. Activities addressed to this special URI shall be accessible to all users, without authentication. Implementations MUST NOT deliver to the "public" special collection; it is not capable of receiving actual activities. However, actor has a publicInbox endpoint is available for efficient shared delivery of public posts; see 7.1.3 Public Inbox Delivery. Client to server interaction takes place through clients posting Activities to a user's outbox. To do this, clients MUST discover the URL of the user's outbox from their profile and then MUST make an HTTP POST request to to this URL with the Content-Type of application/ld+json; profile="https://www.w3.org/ns/activitystreams". The request MUST be authenticated with the credentials of the user to whom the outbox belongs. The body of the POST request MUST contain a single Activity (which MAY contain embedded objects), or a single non-Activity object which will be wrapped in a Create activity by the server. Clients are responsible for addressing new Activites appropriately. To some extent, this is dependent upon the particular client implementation, but clients must be aware that the server will only forward new Activities to addressees in the to, bto, cc, bcc, and audience fields. The server MUST remove the bto and/or bcc properties, if they exist, from the ActivityStreams object before storage and delivery, but MUST utilize the addressing originally stored on the bto / bcc properties for determining recipients in delivery. The server MUST then add this new Activity to the outbox collection. Depending on the type of Activity, servers may then be required to carry out further side effects. (However, there is no guarantee that time the Activity may appear in the outbox. The Activity might appear after a delay or disappear at any period.) These are described per individual Activity below. The Follow activity is used to subscribe to the activities of another user. The side effect of receiving this in an outbox is that the server SHOULD add the object to the actor's following Collection. The Undo activity is used to undo a previous activity. See the Activity Vocabulary documentation on Inverse Activities and "Undo". For example, Undo may be used to undo a previous Like or Follow. The undo activity and the activity being undone MUST both have the same author. Side effects should be undone, to the extent possible. For example, if undoing a Like, any counter that had been incremented previously should be decremented appropriately. ActivityPub supports uploading document types to be referenced in activites, such as images, video or other binary data, and servers MAY implement this feature. To accomplish this, a client MUST submit a multipart/form-data message to the user's uploadMedia endpoint on their ActivityStreams profile object. (Unlike most client to server interactions, using this endpoint does not involve submitting to the outbox.) A client should expect that it must be properly authenticated in order to be able to upload media. The media file file being uploaded. A shell of an ActivityStreams object, which will be finalized by the server. Assuming that the server accepts the request and that the user was appropriately authorized to upload media, servers MUST respond with a 201 Created if the object is immediately available or a 202 Accepted if the server is still processing the submitted media. The response MUST contain a Location header pointing to the new or to-be-created object's id. The server, having done any appropriate processing on the received file and putting it in place, transforms the object that will be retrievable by the id. In particular, servers MUST append an id property to the object, and SHOULD include the uploaded and/or processed file paths in the object's url property. The server MAY wrap the shell object submitted by the user in a Create via 6.1.1 Object creation without a Create Activity if appropriate and present this as the object pointed to by the forementioned Location header in the post-media-upload response. Ben Bitdiddle just recorded a video of his friend's latest invention and wants to upload it to his ActivityPub-compatible social network to show it off. He wants to post a Create of a new Video object, but first he has to upload the video somewhere. Luckily the ActivityPub instance he is on supports the uploadMedia endpoint! In his client, he selects the video for upload and adds a title and a description and presses submit. Ben's client takes a look at Ben's actor profile and finds the uploadMedia endpoint there. Ben's client then constructs a shell ActivityPub object (this doesn't have the url for the video itself yet, but that's okay, because that will be added by the server) and submits it (as the object) along with the video (as the file) by POST'ing to the uploadMedia endpoint. an Activity being created in a user's outbox with their Followers Collection as the recipient. an Activity being created in a user's outbox with directly addressed recipients. an Activity being created in a user's outbox with user-curated collections as recipients. an Activity being created in a user's outbox or inbox which references another object. Servers performing delivery to the inbox or publicInbox properties of actors on other servers MUST provide the object property in the activity: Create, Update, Delete, Follow, Add, Remove, Like, Block, Undo. Additionally, servers performing server to server delivery of the following activities MUST also provide the target property: Add, Remove. Servers MUST de-duplicate the final recipient list. Servers MUST also exclude actors from the list which are the same as the actor of the Activity being notified about. That is, users shouldn't have their own activities delivered to themselves. What to do when there are no recipients specified is not defined, however it's recommended that if no recipients are specified the object remains completely private and access controls restrict the access to object. If the object is just sent to the "public" collection the object is not delivered to any users but is publicly viewable in the actor's outbox. An HTTP POST request (with authorization of the submitting user) is then made to to the inbox, with the Activity as the body of the request. This Activity is added by the receiver as an item in the inbox OrderedCollection. Attempts to deliver to an inbox on a non-federated server SHOULD result in a 405 Method Not Allowed response. For federated servers performing delivery to a third party server, delivery SHOULD be performed asynchronously, and SHOULD additionally retry delivery to recipients if it fails due to network error. Servers SHOULD also take care not to overload servers with submissions, for example by using an exponential backoff strategy. Note: Activities being distributed between users on the same origin may use any internal mechanism, and are not required to use HTTP. The values of to, bto, cc, bcc, and/or audience contain a Collection owned by the server. The values of inReplyTo, object, target and/or tag are objects owned by the server. The server SHOULD recurse through these values to look for linked objects owned by the server, and SHOULD set a maximum limit for recursion (ie. the point at which the thread is so deep the recipients followers may not mind if they are no longer getting updates that don't directly involve the recipient). The server MUST only target the values of to, bto, cc, bcc, and/or audience on the original object being forwarded, and not pick up any new addressees whilst recursing through the linked objects (in case these addressees were purposefully amended by or via the client). For servers hosting many actors, delivery to all participants can result in an overwhelming number of messages sent. Some servers would also like to display a list of all messages posted publicly to the "known network". Thus ActivityPub provides an optional mechanism for serving these two use cases. When an origin server is sending an activity to a remote server which is addressed with the special Public recipient, the origin server MAY reduce the number of actors delivered to by identifying all actors which would be recipients who share a publicInbox who would otherwise be individual recipients and instead deliver to only publicInbox objects. (An origin server MAY alternately decide to publish all posts to all publicInbox endpoints known.) The server with the receiving publicInbox should use its own following lists to determine which actors should have the post delivered to their inbox. Thus in this scenario, the remote/receiving server participates in determining targeting and performing delivery to specific inboxes. Origin servers sending publicly addressed activities to publicInbox endpoints MUST still deliver to actors and collections otherwise addressed (through to, bto, cc, bcc, and audience) which do not have a publicInbox and would not otherwise receive the activity through the publicInbox mechanism. The side effect of receving this in an inbox is that the server SHOULD add the actor to the object user's Followers Collection. The side effect of receving this in an inbox is that the server SHOULD increment the object's count of likes by adding the received activity to the likes collection if this collection is present. Upon receipt of an Announce activity in an inbox, a server SHOULD increment the object's count of likes by adding the received activity to the shares collection if this collection is present. Unfortunately at the time of standardization, there are no strongly agreed upon mechanisms for authentication. Some possible directions for authentication are laid out as follows. ActivityPub implementations may use OAuth 2.0 with JSON Web Signatures [ RFC7515 ] for authentication and authorization. This has the advantage of wide deployment of OAuth 2.0 technologies. However, OAuth 2.0 technologies are frequently incompatible, and the agreed upon mechanisms for deploying via OAuth 2.0 are still in flux, so it is not feasible to recommend a general pattern for OAuth 2.0 based deployments at this time. For client to server interactions where the client is interacting directly to the actor's server, clients may use OAuth 2.0 bearer tokens to authenticate. Bearer tokens may be acquired out of band. They may also be acquired using OAuth 2.0 authorization. To discover the correct endpoint for authorization, clients should use [ OAuth-Server-Metadata ] on the host part from the actor's ID URI. Client IDs may be acquired out of band for some servers. They may also be acquired using [ RFC7591 ]. For client to server interactions where the client is interacting with servers beyond the user's origin server, clients and servers may support use of OAuth 2.0 with JSON Web Signatures. Servers performing operations on behalf of a user (e.g. delivery to a recipient) may use OAuth 2.0 with JSON Web Signatures to authenticate with a 3rd party server. ActivityPub implementations may use Linked Data Signatures and signed HTTP messages for authentication and authorization. (Linked Data Signatures are best used when authentication is meant to be "long lived" and attached to an object, such as verifying that an object truly was posted by this actor, and signed HTTP messages should be used when authentication or authorization is ephemeral.) This has the advantage of clean integration with existing JSON-LD based technologies already used by ActivityPub. However, at the time of specification, Linked Data Signatures and HTTP signatures are very young, particularly in adoption. When Linked Data Signatures is used in combination with ActivityPub, the server should assign an actor a public and private key pair, and link the public key to the actor's profile object, which may later be used with the Linked Data Signatures verification algorithm to validate the authenticity of messages passed along the network. For client to server interactions where the client is interacting directly with the actor's server, a client may use HTTP signatures by registering their client's public key with the actor on the server and subsequently using this key to sign any HTTP requests made. For client to server interactions where the client is interacting with servers beyond the user's origin server, clients may use a combination of HTTP signatures and Linked Data Signatures. In this scenario, a client would have their client key authorized for a limited window of time by the key listed on their actor profile. The client key would then be used to sign HTTP requests made to the foreign server while also providing the signature of the client public key, signed by and linked to the key on their actor profile. Servers performing operations on behalf of a user (e.g. delivery to a recipient) may use Linked Data Signatures to authenticate with a 3rd party server. This may be achieved by attaching the linked data signature to the activity posted to the remote inbox, signed by the actor's public key. Servers receiving activities verified via Linked Data Signatures SHOULD NOT process an object with a nonce they have seen before, so as to prevent replay attacks. Servers should be careful to verify that new content is really posted by the author that claims to be posting it, and that the author has permission to update the resources it claims to. Discussion of how to accomplish this is laid out in the 3. Objects and 8. Authentication and Authorization sections. Owen Shepherd built the initial version of this specification, borrowed from the ideas in the Pump API document, mostly as a complete rewrite of text, but sharing most of the primary ideas while switching from ActivityStreams 1 to ActivityStreams 2. Jessica Tallon and Christopher Allan Webber took over as editors when the standard moved to the W3C Social Working Group and did the majority of transition from Owen's document to its current state as ActivityPub. ActivityPub's actors may contain information about the associated user. At minimum, the actor profile contains an identifier which also provides a mechanism for contacting the actor, through the exposed actor's inbox. Aside from this, ActivityPub does not mandate any personally identifiable information to operate, though depending on the implementation, any number of details may be exposed on the actor's profile, particularly user names and real names. Additionally, a notification payload could include personally identifiable information, depending on the implementation and use, but it is again not required for the core functionality to operate. Added Evan Prodromou and Owen Shepherd as authors to spec.